Founded as a nation of immigrants, the United States has remained so throughout its expansion and development, and today, immigration continues to shape and reshape the country and its states. The U.S.’s history as an immigrant nation has created the rich racial and ethnic diversity that strengthens our society and creates the unique American experience that enables the country to thrive. But while most public dialogue still revolves around the ideal that every hardworking person has an equal opportunity to succeed here – regardless of their status at birth – the facts tell us that is simply not the case. The troubling reality is that people of color and immigrants are simply not afforded the same opportunity that is made available to many white and native-born Washingtonians. In Washington state circa 2016, people of color and foreign-born individuals face significant disadvantages at each stage of life; conversely, white and native-born people disproportionately receive, and benefit from, more economic opportunity than others. Not surprisingly, a wide variety of measures of economic security and indicators of upward mobility show that on average, whites consistently experience better outcomes than people of color, and the native-born population consistently experiences better outcomes than the foreign-born population. Children of color and those in immigrant families are more likely than white or native-born children to be in poverty, face academic challenges in school, and be suspended or expelled. They are likewise more likely to fall through the cracks before graduating high school, and they are much less likely to get into, be able to pay for, or complete college. They are also more likely to grow up and work in low-skilled and physically demanding jobs that pay less and provide less financial security in the long run. This is true in some cases regardless of educational attainment. One in five immigrants works in a job where their education or experience is underutilized. The compounding result of these unequal opportunities is that at almost every turn, it is difficult for the people who are part of Washington’s fastest-growing populations to achieve upward economy mobility. It is harder for people of any race or background who are born poor to move up the income ladder than it is for those who are born better off. And it is harder for people of color to move up the income ladder than it is for white people – regardless of the income of their family of origin. Unless we reject policies that – intentionally or not – hamper opportunity for families of color and immigrant families while lifting up White and native-born families, lines of class, race, and ethnicity will harden and continue to divide us generation after generation. That is not a recipe for promoting economic dynamism, social and civic improvement, an engaged electorate, or other essential foundations of a sound and lasting economy, society and democracy. Economic mobility is one way to measure a society’s level of success in ensuring equal opportunity for all its people. Economic mobility measures how likely a person is to move up or down the income ladder over time. If opportunity is broadly available to demographically different segments of the population, each would be expected to show similar degrees of mobility in comparison to the other. However, if one or more groups consistently receive a greater degree of opportunity, their outcomes (as measured by mobility) will differ markedly from those with less opportunity. Absolute mobility compares a person’s income to another in the past – for example, to that of their parents at the same age. Relative mobility compares a person’s income relative to their peers, based on the income bracket they were born into. While Americans commonly believe a person can be born poor and – with hard work – attain wealth, the reality is this degree of upward relative mobility is extremely uncommon. Americans generally experience high absolute mobility, meaning they generally have higher incomes than their parents did at the same age – and low relative mobility, meaning those born into one income group are unlikely to move significantly up or down the income ladder in their lifetime. Only 4% of those born in the bottom income quintile make it to the top. In fact, in general, people born at the bottom and top of the income ladder tend to stay there. Seventy percent of Americans born at the bottom of the income ladder never even make it to the middle. The factors that influence economic mobility interrelate in ways that restrict opportunity among immigrant communities and communities of color. Human capital – things like educational attainment and employment – are unquestionably key factors that promote economic security. 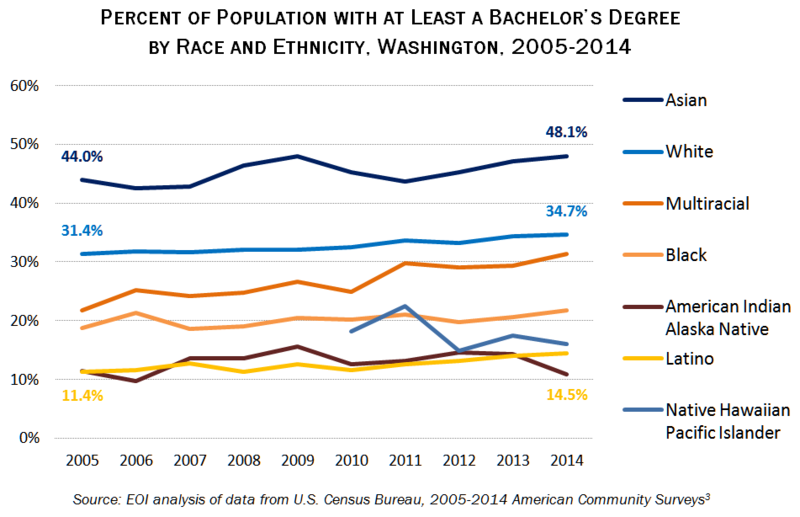 A college degree is one of the strongest indicators of upward economic mobility in our country. But a person’s status at birth, including race, ethnicity, nativity and gender, also plays a significant role – too significant a role in many cases. People of color are not only less likely to be able to access the educational and employment opportunities most likely to increase their chances of upward mobility – but they are also less likely to experience upward economic mobility even when those factors should work in their favor. Unequal opportunity creates disparate levels of economic security between people of color and immigrants, and their white and native-born counterparts. The inequities are evident in nearly all measures of economic stability. 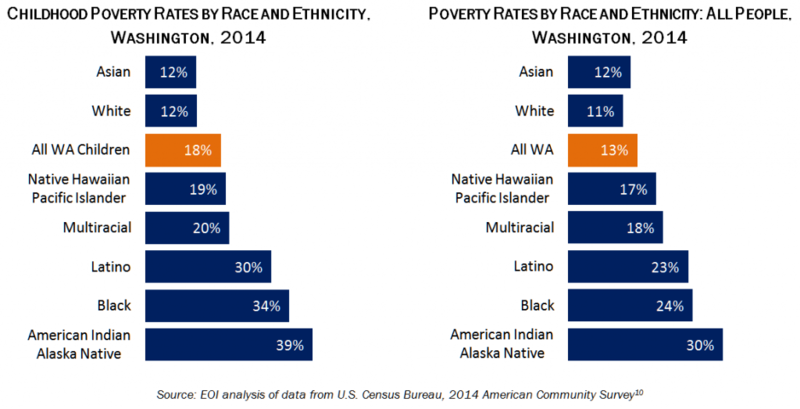 Without significant structural and policy changes, and especially as immigrants and people of color comprise a greater share of Washington’s population each year, unequal opportunity based on race and nativity will continue to present an increasingly crucial and pressing set of challenges for our state.